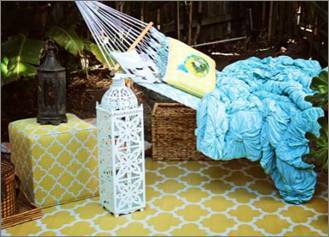 Colour the Floor with New Fab Habitat Outdoor Rugs and Pouffes! 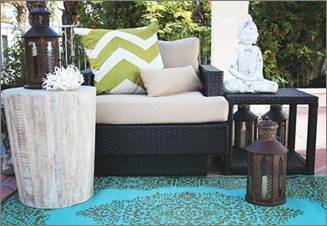 A simple and easy way to update an outdoor space is with colour in the form of an outdoor rug. As with indoor rooms, a rug outside will encourage guests into a space, draw furniture together and offer feet an alternative to bare ground. Whether you live in a spacious house or a tiny apartment, Fab Habitat rugs and pouffes available at cuckooland.com are a simple way to change the look and feel of a room or garden without having to completely redecorate. Their colourful, stylish designs will anchor furnishings and provide an interior like appeal that can withstand the elements outside. Made following the fair trade principles, the range is woven in India from recycled plastic and the colours are UV stabilized, which prevents fading and deterioration. The rugs are also mildew resistant, easy to clean and lightweight. Available in 12 gorgeous designs, the rugs are reversible to change the look of your home or garden. Suitable for indoor and outdoor use, the rugs measure 1.2 x 1.8m and 1.5 x 2.4m and roll up into an eco-friendly carry bag, making them portable for trips to the beach, picnics and camping. 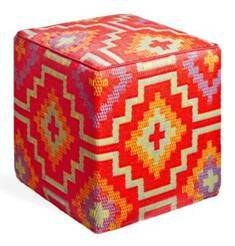 In addition to the gorgeous new designs and colourways, Fab Habitat have also launched three pouffes, to compliment the Tangier, Lhasa and Cancun designs (£109). Made from recycled materials, these designer Cubes can be used indoors or outdoors and make the perfect addition to your summer entertaining. 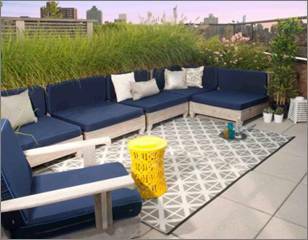 Scatter them indoors or out as extra seats or side tables. The cover is handmade from recycled polypropylene and filled with polystyrene, for long-lasting comfort and colour retention. They even stack easily for storage. A modern reinterpretation of the “magic carpet”, this Arabian Nights inspired pattern is the stunning focal point of the Istanbul rug. Allow the neutral, soothing colours of the geometric Manchester to add a calming influence to any space. Inject a Moroccan theme with the curvaceous design of the Tangier, or add a little bohemian flair with the Tibetan inspired Lhasa. 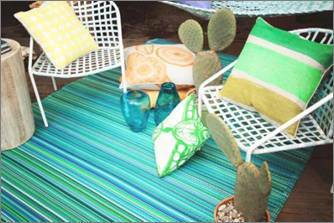 The classic striped pattern of the Cancun makes it easy to incorporate into any space, the array of vibrant hues makes it a best seller.